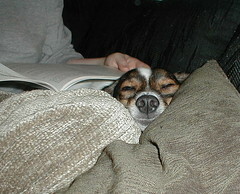 The nice thing about a little dog is that they can be very blood pressure lowering. Tiki is particularly good at this and likes to be nestled right up against whatever person she is sitting with. Sometimes she’ll lay her head on your shoulder and just SIGH contentedly. She really is heartbreakingly cute. Medicinal, even. Mr. YP has set his moving date and it is not far off at all. I can’t focus on any knitting whatsoever right now except the most stupid, mindless stuff. I wish I could say that this was the thing that spurred me into action and I decided to master Shetland lace or Orenberg lace or Fair Isle, but frankly, no. About the most I want to do right now is hang out in my ratty Dartmouth shirt, pajama bottoms and watch reruns of Battlestar Galactica. So here it is, therapy knitting in the extreme. The most boooooring knitting… in the WORLD. /Eddie Izzard> The Divorce Scarf. I have enough yarn to stretch this one out for quite a long time if I don’t knit at it every second, and hell, if I do run out? I’ve got a LOT of Cascade in stash and will cast on Divorce The Sequel, Scarf From Hell if really there is a need. Atacama alpaca handpaint with some mystery wool Interlacements handpaint – both from stash. 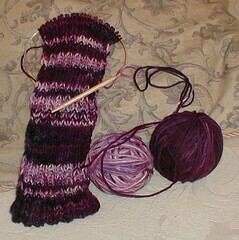 2×2 rib in random stripes, on slightly larger than called for needles. And when it’s done, I hope to have knitted through the very worst parts of all this and I will cast off and then the scarf will wrap (twice! three times! maybe?) around my neck comfortingly. It will be evidence that I did it. Every stitch in the scarf will be a moment that I survived this process. I guess I’ll pick up stuff like the remaining Baud sock and the Painter’s scarf and all the other undone projects as I find I have the mental energy. And do nice soothing 2×2 ribbing when I don’t. There is no finish line, after all. No agenda. I can be the boss of my own knitting. I do have the bestest pals ever and one of them came up with this charming little project bag to keep my knitting in when I’m on the go. It’s just big enough for a scarf or a pair of socks or a sleeve and I find it immensely cheering. 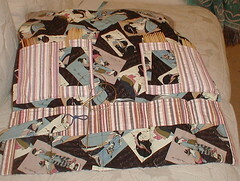 Another girlfriend sent me this swanky handmade geisha fabric needle case. 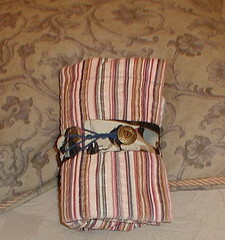 It is sized specially to fit my dpns and circs, since I keep most of my longer straights in a vase on the shelf (knitter interior decorating) and she is going to sell them at craft bazaars in her hometown. Personally, I’m hoping she opens an ETSY store because the workmanship on this is first class and I bet she’d do very well selling them. Truly I have the best friends ever, both near and far. I wish some of y’all were free (and local!) next Friday for post husband moving out red whine wine, yarn and devils food cupcakes. I anticipate that there will be a lot of bad jokes. I so wish that I were “local” so I could come over for the party.. but I’ll have to peek in from the computer screen instead! I’m glad that you won’t be facing that night alone. 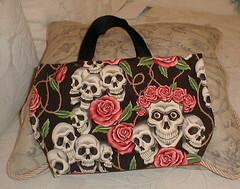 I love the skull bag.. very cool! I happen to be booked that night, babysitting for a friend while she tells her DH that it’s over. Her kids are sleeping at my house. Then we’re going to Disneyland in the morning. Hope it goes well for her and hers and you and yours. SS, wow, what is it, something in the water? The stars are aligned in some crappy death to marriage configuration? I send good thoughts to your friend. I hope she and her kids will be ok and send her good, strong thoughts. I will pass your well wishes along to her and I’m sure she will send hers to you as well. Peace. I wanted to express my sympathy, and de-lurk. I started reading your blog about a year ago when I moved to LA and commenced a move-in with a 4-year partner…and then a move-out and a breakup. I was in a sad/confused/hopeful place like you are now and your blog inspired me to start knitting again, which helped me through everything. Yeah, I’m a terrible commenter, but I’ve enjoyed your thoughts on Surfas, yummy food, great yarn, and all sorts of stuff. I’ll pray to the Universe for strength (and occasional comic relief) for you. In your shoes I would be snuggled up in my oldest, comfiest clothes, under a warm quilt, with a large plate of chocolate next to me, frantically knitting stockinette and hoping I didn’t mess it up — this from the woman who adores intarsia cables. Oh YP, I wish I was local as well. (though I’ll be kind of passing through in March) I wish you well as you go through this, and will be thinking of you often. I tried to comment the other day and was having, um, issues with it. I am so sad for you. I know how heavy your little heart is and I wish I WAS closer to be there for the red wine and cupcake party because I’d just sleep over. Hugs YP…many many hugs. You can get through this. Time will pass. If you suffer miserably, gnawing at your own hands and regretting every breath you ever breathed, time will pass. If you love and nurture yourself, look for the good, and find something of beauty in every day, time will also pass. And in tme, this will all hurt less. Wish I could make it all better. We are with you in spirit. …um, and I just popped in from a link from Lucia’s blog, but fervently wish you well anyhow. The bag! The needle case! The overwhelming jealousy! !